The first thing you normally do when you take a volume apart is to number all the pages in pencil, so you know exactly how everything fits together. However, in this case, there were two issues preventing me from doing that: turning over the pages to number them risked destroying some of the damaged areas and at some point someone else had gone through the volume and numbered it in pencil in the top right corner of each page. Great, you might think: just use the existing numbering and go ahead! Unfortunately, relying on someone else’s numbering is never a good idea, as they may have made mistakes and they may not have numbered all the pages you need to be numbered before taking a volume apart. 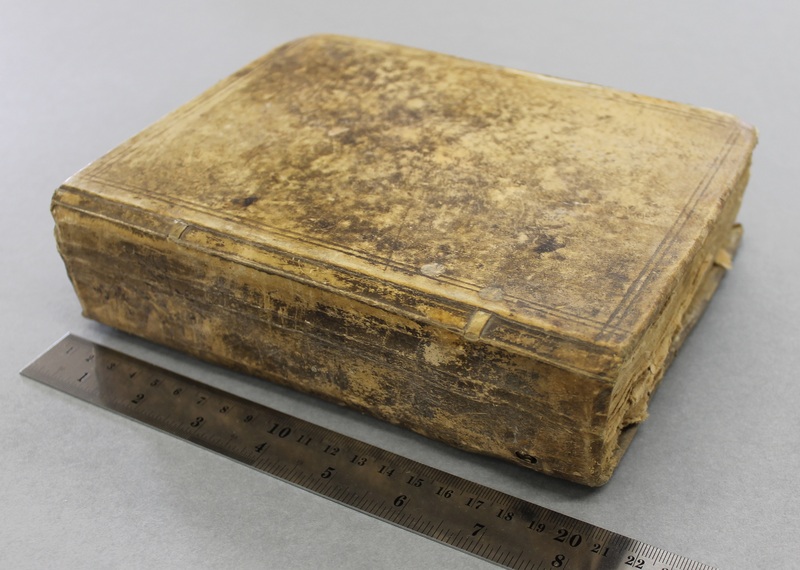 All volumes (whether they are hand-written manuscript volumes or printed books) are bound with endleaves at the front and the back. 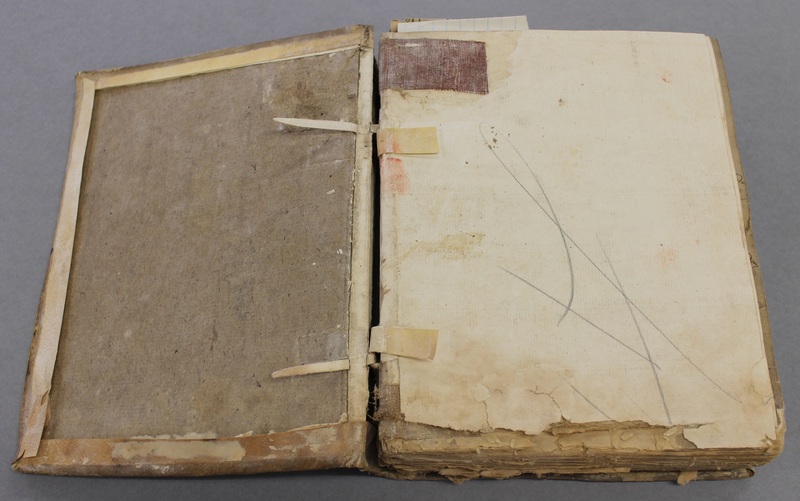 The first and last page of these blank sheets are stuck to the boards and help hold the binding together – no one ever counts these endleaves when counting the number of pages of a book and equally no one ever numbers these. 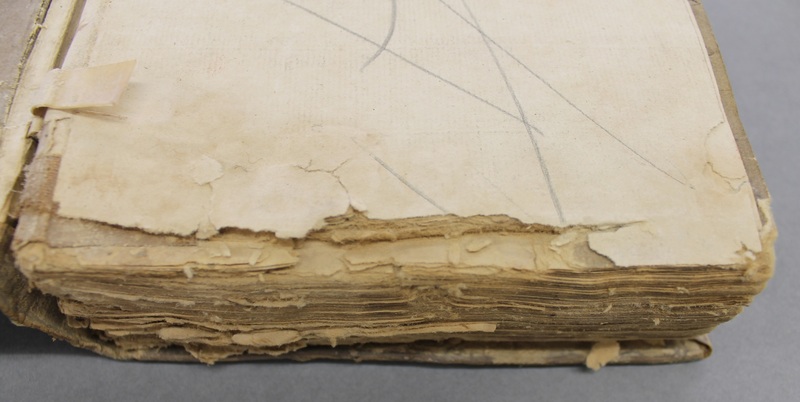 Except for conservators, who need to know exactly how each page relates to every other page. In this case, as you can see, the front endleaf has become detached from the board, showing more details of the binding, whereas the back endleaf is still in place and has been written on. To avoid confusion and prevent further damage I have decided not to add any additional numbering, but to number the endleaves with roman numerals as I take the volume apart and hope the old numbering will be reasonably accurate. As always when taking a volume apart I will be keeping detailed notes of how all the pages fit together, so if there are issues with the old numbering I can keep a record of those and still fit everything back together as it should be. 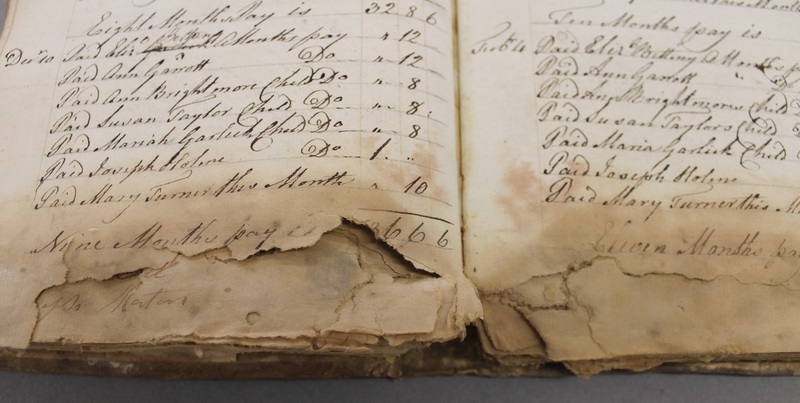 In order to help us prioritise which of our thousands of documents to repair next, we keep a record of everything that gets requested in the Searchroom but we’re unable to give access to because of its poor condition. 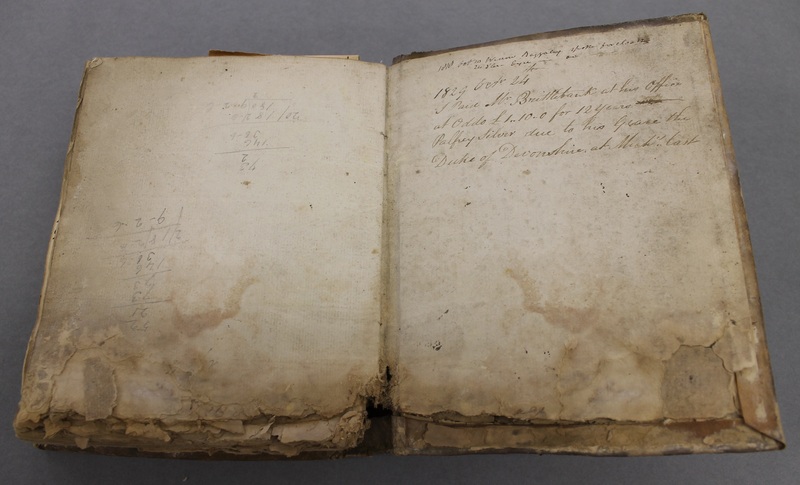 This account book of the Overseers of the Poor for Great Longstone and Holme from 1789 to 1829 (D307/C/4) has been requested several times and is my latest project. In the above picture the volume doesn’t actually look very damaged: its original parchment binding is still sturdy, so you would expect the paper textblock to have survived equally well. However, when we take a closer look, we can see how badly the bottom quarter has suffered from water and mould damage. The volume was probably stored in damp conditions for a long time, with that lower quarter getting especially moist, which encouraged mould to grow. 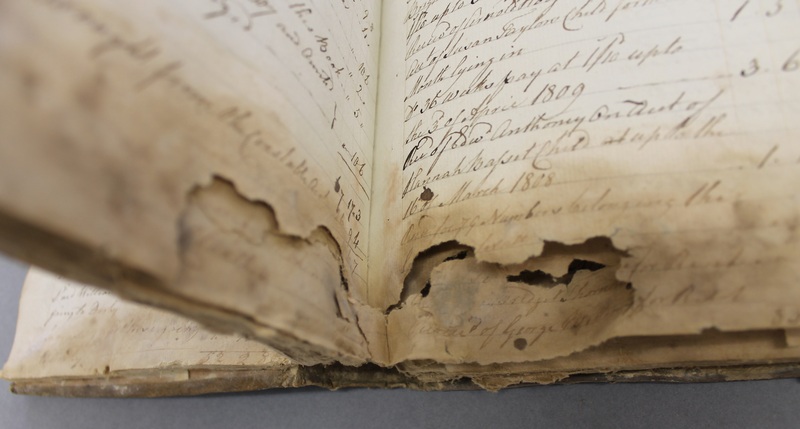 The combination of the water and the mould seeped all the strength out of the paper, so although it has long since dried and there’s no more live mould the paper crumbles into dust as you touch it. The bottom edges of the volume, affected by damp and mould. Paper crumbling when pages are turned.